At the start of the twentieth century a majority of voters on the island of Ireland in the referendum-style general election of 1918 supported the pro-independence “Nationalist” side. A minority of voters on the island supported the anti-independence “Unionist” side. However, unionists refused to accept the outcome of the 1918 plebiscite-election and insisted that the democratic mandate of the electorate on the island of Ireland was subordinate to that of an anti-independence minority in the north-east of the island. A majority of voters on the island of Ireland in the referendum-style local elections of 1920 supported the pro-independence “Nationalist” side. A minority of voters on the island supported the anti-independence “Unionist” side. However, unionists refused to accept the outcome of the 1920 plebiscite-elections and insisted that the democratic mandate of the electorate on the island of Ireland was subordinate to that of an anti-independence minority in the north-east of the island. 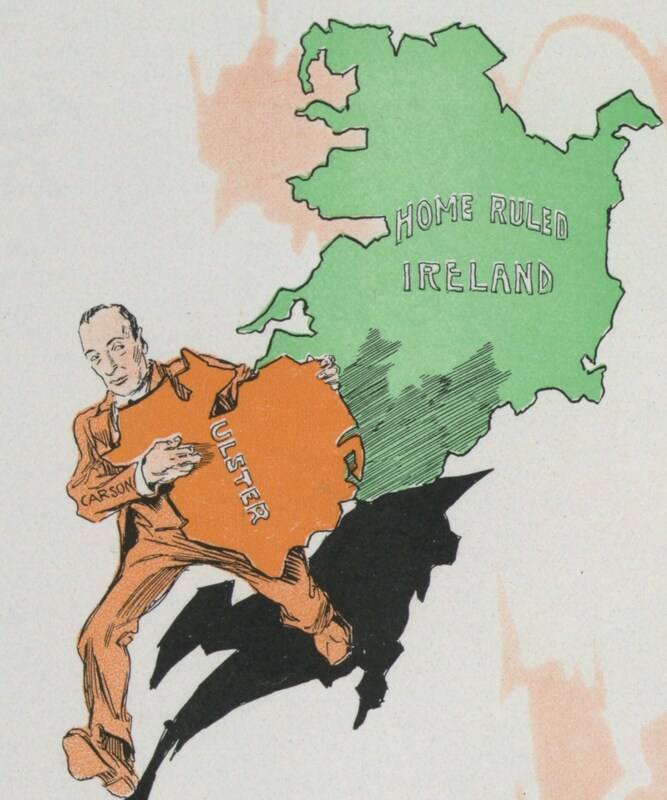 A majority of voters on the island of Ireland in the referendum-style partition elections of 1921 supported the pro-independence “Nationalist” side. A minority of voters on the island supported the anti-independence “Unionist” side. However, unionists refused to accept the outcome of the 1921 plebiscite-elections and insisted that the democratic mandate of the electorate on the island of Ireland was subordinate to that of an anti-independence minority in the north-east of the island. At the start of the twenty-first century a majority of voters in the north-east of the island of Ireland in the Brexit referendum of 2016 have chosen to support the pro-European “Remain” side. A minority of voters in the north-east of the island have chosen to support the anti-European “Leave” side. However, unionists refuse to accept the outcome of the 2016 Brexit referendum and insist that the democratic mandate of the electorate in the north-east of the island of Ireland is subordinate to that of an anti-European majority on the island of Britain. This is the fundamental hypocrisy that lies at the heart of ideological British unionism and why it remains, in essence, an anti-democratic and fascistic hangover of early 20th century Europe. Unionist politicians and their apologists define democracy and the mechanisms of democracy as they see fit. If it meets the immediate needs of the unionist minority in the north-east of Ireland, the British-administered Six Counties, then any amount of constitutional or legal contortions or distortions are permitted. Indeed, some believe they should be welcomed. It is also the great paradox of Irish politics, and relations between Ireland and Britain. How do you accommodate those who keep redefining the nature of the accommodation? You can see the schizophrenic workings of all this in the wake of the United Kingdom’s decision to withdraw from the European Union, in the process also taking hundreds of thousands of Irish and EU citizens living under its authority – but inside Ireland and Europe – out of the union. The government in Dublin continues to struggle with the impossibility of squaring this circle, fearful of the potentially dire consequences for the north-eastern part of the country. What was previously the unthinkable for the conservative establishment in the Oireachtas, the Fine Gael and Fianna Fáil arms of the Continuity State, has now become the subject of frequent discussion. Whether that is idle or not remains to be seen. “Britain’s exit from the EU could result in an “uncomplicated route” to a united Ireland, Taoiseach Enda Kenny told a private Fine Gael fundraising event. Mr Kenny again raised the prospect of a united Ireland as a possible outcome of Brexit at an event for one of his backbenchers. The Taoiseach is also understood to have said that Northern Ireland should not have to wait 20 years to re-enter the EU as Scotland would likely have to. Those present took this part of Mr Kenny’s comments to mean that Scotland will leave the EU with the rest of Britain, but would re-enter upon gaining its own independence, a process that could take two decades. Kenny has claimed in public that the remarks he made in private have been blown out of proportion but there seems to be little doubt that his words were accurately reported. Whether Fine Gael as a whole has actually made the intellectual leap to contemplate some sort of reunification process in the near future is another matter. One they might have no choice in should the worse-case scenario for a new “Brexit border” around the Six Counties come to pass. Sigh. The rotten corpse of Unionism still refuses to lie down and give up. A particular political contortion, in Northern Ireland, is that of the distribution of the Unionist population. West of the River Bann, they are a small minority. East of it, they are penned into an arch mostly in Belfast. If a poll was held tomorrow on a local basis, The majority West of the Bann would be for a United Ireland. But that territory is essential for unionism. So a large number of the Irish are being held political hostage, to the Unionists and the London Government. I think that a serious effort has to be made to talk to the Unionists, to explain the consequences of staying in a BREXIT UK. I am going to be utterly realistic here. They will refuse to see common sense. At that point, fair enough. We would have tried. At that point, we need to consider the implications of the hard border that will be required by the EU, and the collapse of the British Isles common travel area. (Not sustainable, with a hard BREXIT and border.). plus the residency rights of Irish Citizens in the UK. Also at risk. The only practical policy is then to join the Republic to the Schengen travel area, have a sealed border with the North, and with the rest of the UK, no common travel area, (It would be unworkable) and the enforcement by the EU of the non-EU visa requirement on the residents of the North, and the rest of the EU. not to mention no customs Union, tariffs, etc, on the North. I think we have to apply Triage here. The North, in its present situation, is unsustainable and unworkable as an entity, and needs to be quarantined behind an EU frontier of the kind used by EU with other Non-EU states. (Commission will probably insist on this.) Otherwise, the North is going to do serious damage to the Republic. Those citizens of the North with Irish passports, may come and go as they wish to the republic, the rest need the EU travel visa. Full enforcement of the EU trade barriers. Then wait. For as long as is required. I give it a decade, before the old Orange slogan, “No Surrender” has to be changed. Much humiliation, I dare say, for them, but in the meantime, the headbangers have been tightly contained, and it is there own fault entirely. But offer the option of reunification first. The Dublin Government can demand one, under the peace agreements. Enda, over to You. Stop hiding under your desk,. On the issue of demographics it is certainly true that “Northern Ireland” – in strictly unionist terms – has gone from 3.5 counties to barely 2. Maybe 1.5. Which is down from the 9 counties originally demanded by Carson and company in 1914. Excellent article – again – Seamus. Thank you. In addtion, your post above illustrates that the present situation for Unionists is now far worse that what was the position at the time of the artificially, undemocratically, forced Partition of the country in almost every single metric. It would appear that Unionism is determined – absolutely determined – to refuse to negotiate terms for a Re-United Ireland until such time as Unionists are in their weakest possible bargaining position, I.e., when they become the ELECTORAL minority in the North of the country. I’ve crossed the border a few times. Can’t believe anyone would be mad enough to build a border fence on it. J, there was a full military-style border in place for several decades from the 1970´s on. Anyone crossing got to look down the barrel of a gun etc. Most people will still remember this. Brexit is a catastrophe for Unionism – hard or soft. In the short term, it will only succeed in highlighting the north of Ireland statelet’s continued dysfunctionality and it’s necessity to be treated totally differently from Britain. In the longer term, Brexit is going to hit the north harder than anywhere else in the UK – and along with the inevitable Nationalist ELECTORAL majority, the combined effect will be a major game-changer as the inevitability of a Re-United Ireland sinks in. From the mid-2020’s onwards, Unionists will be doing business as a minority in the north with a Nationalist-dominated north as part of an Ireland in a Nationalist-dominated Ireland. No need for Unionists to have any fear in the inevitable re-United Ireland – they will get pretty much what they want as Nationalist Ireland is not a supremacist mindset nor is Nationalist Ireland interested in lording it over Unionism. All that triumphalism and swashbuckling is an Orange-y thing-y and has no place in a Re-United Ireland. You cannot break it down like that. Antrim and Down voted Leave, all border areas, Remain. Derry, Tyrone, Fermanagh are all nationalist republican areas, you want Bosnia? Cantonment?